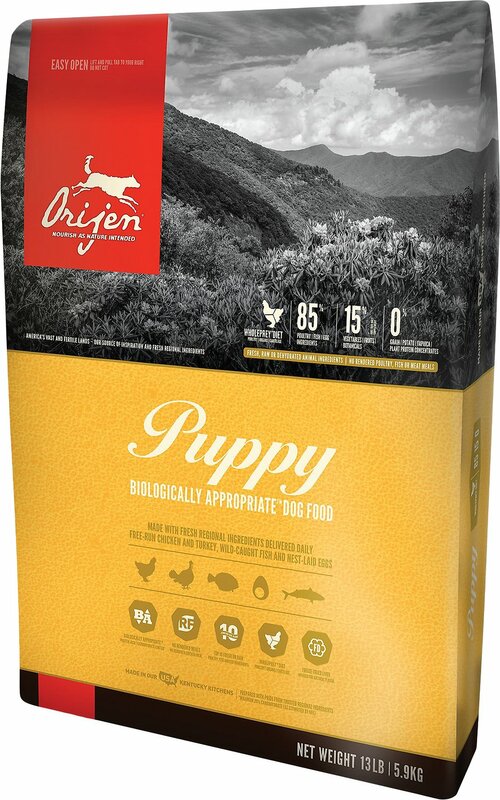 ORIJEN PUPPY features a Biologically Appropriate (80.20.0) ingredient ratio of 80% meat, 20% fruit and vegetables and 0% grain - all slow-cooked at low temperatures to retain their natural goodness. All puppies are adapted for a diet rich and diverse in meat proteins - not grains and plant proteins. With 80% poultry, eggs, meat and fish, ORIJEN PUPPY features high ratios of meat and protein to mirror the natural puppy diet. Orijen dog food is arguably the highest quality dry dog food on sale today. Fresh deboned chicken (20%); dehydrated chicken (15%); fresh chicken liver (4%); fresh whole herring (4%); fresh deboned turkey (4%); dehydrated turkey (4%); fresh turkey liver (3%); fresh whole eggs (3%); fresh deboned walleye (3%); fresh whole salmon (3%); fresh chicken heart (3%); chicken cartilage (3%); dehydrated herring (3%); dehydrated salmon (3%); chicken liver oil (3%); chicken fat (2%); red lentils; green peas; green lentils; sun-cured alfalfa; yams; pea fibre; chickpeas; pumpkin; butternut squash; spinach greens; carrots; Red Delicious apples; Bartlett pears; cranberries; blueberries; kelp; liquorice root; angelica root; fenugreek; marigold flowers; sweet fennel; peppermint leaf; chamomile; dandelion; summer savory; rosemary; Enterococcus faecium. * DELIVERED FRESH preservative-free and never frozen.